First of all, the previously announced ES6 only version is being delayed a bit, as the required amount of work to actually convert the whole library is much more complex than initially expected and it has then been a trade off discussion between adding or fixing new stuff in the current ES5 one, or just focusing on a completely new ES6 one. Various fixes to renderable and sprite based objects. One additional major change in this version though, from the ES6 to-do list, is that all previous language "extension" have been removed and "sandboxed" under the 'me' namespace. Which beside preventing polluting the global namespace, will allow to properly define independent modules. Last but not least, as usual, check our Wiki for further information, the upgrade guide (this time again the changes are really limited), and of course our forum. That's it for today, let us know what you think, including about your expectations for the next version ! As for the next version, we will certainly keep supporting the 5.x branch in parallel for bug fixing or small improvements, but as communicated in our previous blog post, all new features will be added from now on only on the 6.x branch (starting with ES6 class constructor and ES6 module). Last but not least, as usual, check our Wiki for further information, the upgrade guide, and of course our forum. That's it for today, let us know what you think, including about your expectations for the next 6.0.0 version ! As announced previously in anticipation for ES6, we completely dropped support for all legacy browser/devices not fully supporting ES5, which means that we removed all related polyfill and/or deprecated events from melonjs. If for any obscure reasons you still need to run things on these oldies, you can use an es5-shim to provide with the missing ES5 features (and it is actually now also included in our boilerplate). 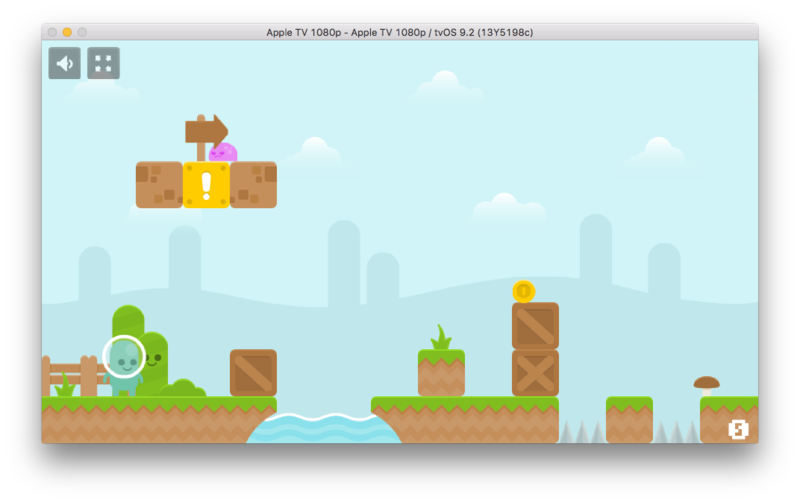 The platformer example has been improved as well and now features a virtual gamepad for when used on touch-enabled devices. Definitely a good start for those looking at adding one to their game, give it a try here ! Also do note that a 5.0.1 version has been published in the mean time, fixing a couple of regressions, so make sure to download that latter version from here ! Don't forget to check our Wiki for further information on how to use melonJS but also all for how to use the third party tools that we support like Tile of course, but also TexturePacker, PhysicEditor, BitmapFont Generator, PhoneGap, Ejecta, and others ! And of course comments and feedback on this last version are welcome through our forum. We had lots of great feedback after the last 4.0.0 version, some good ones about the new features introduced, but as well bug reports, so together with the new year it's time for a new release. WebGL : added error management for NPOT textures, removed the automatic creation of a canvas overlay for standard font (as a reminder, you should not use regular fonts with WebGL, but rather bitmap fonts) which will save you a couple of sweet megabytes. Pointer Event : fixed a bug on device allowing both mouse & touch events, fixed multiple regressions on multi-touch and mousewheel events. Tiled : cleaned-up and exposed the TMX renderers classes, added several utility methods to convert vector and shapes from and to isometric space coordinates. Known issue : there is currently a limitation in the 4.1.0 release (from the 4.0.0 version), where applying a transformation to a Sprite does not work if added directly to the game world (as opposed to use that sprite as the renderable component for an entity). This can easily be fixed though by setting the sprite `autoTransform` property to true (see the ticket here). Although it seems an easy fix, this has triggered other changes in the engine linked to anchor management and will therefore only be included in the next major version (as it causes changes in behaviour). Finally, 4.1.0 being a non major release, there is therefore no API changes at all, so you can just replace the previous 4.0.0 version with this one. melonJS 5.0.0 : this is 2017 guys, ES6 is almost there and we should almost all already be using it ! But as a first step we decided to completely drop support for all legacy browsers (e.g. not fully supporting ES5). So starting from the next major version, all ES5 polyfills will be removed which means that it's definitely time to update your browser if you want to keep using melonJS. If for any obscure reasons you still need to run things on these oldies, you can use an es5-shim to provide with the missing ES5 features. There is no date yet specifically about these two versions, but 5.0.0 will obviously be the next major version, followed by a 6.0.0 later this year as well. That's it for today ! Once again thank you guys for your support and feedback on melonJS and see you around on our forum or chat ! First of all, lots of improvements have been made since the last version, and especially focusing on the matrix and shape implementation, and related bounding box, transformation. This is not maybe super obvious for now, and more will certainley be done around this in the coming weeks, but it enables a lots of cool things like body shapes free transformation (with bounding box automatically resizing accordingly), free transformation for any renderables (which allows for some more cool stuff like rotating a TMX level easily), and also (for later) to use it as a projection matrix for our viewport/camera. This new version should be quite stable already, it has been used for a couple of projects already, and no major issues were detected. We also spend a bit of time improving our automatic test units, in order to improve code quality and limit regressions in newer versions. Last but not least, API changes are really minimal (see the upgrade guide), the only reason behind the major version bump being the bitmapfont, as a new font data is now required for the constructor, and thus breaking the previous API compatibility. Small reminder, don't forget that our Wiki also contains a tons of information on how to use melonJS but also all the third party tools that we support like Tile of course, but also TexturePacker, PhysicEditor, BitmapFont Generator, PhoneGap, Ejecta, and others ! Last but not least, a small reminder on our small giveaway contest, where you can win a license of the awesome Master Spy game, still plenty of time to enter and try your luck !